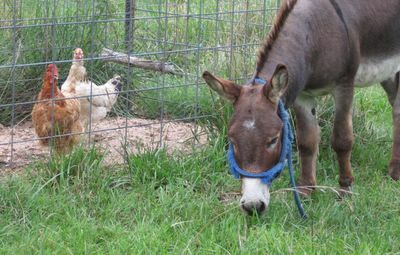 Yesterday I promised an explanation for the humiliating state of Donkey Doodle Dandy's halter, and I plan to get to it later today. A big thunderstorm is hopefully going to drop a lot of rain on us in about 30 seconds, so I figured I'd at least post today's photo while I could get online. In the meantime, your wonderful comments on yesterday's photo had me laughing out loud. Leave it to Dan's friends and fans to creatively explain what I only saw as an embarrassment! Susan: I'll swap you some basil for olive oil! My oil shop is closing down and I bought 9 bottles yesterday (plus a few vinegars as well). As for basil, the stuff you get here is pathetic. Like four wilted stalks for $2. Or better yet, just send me some pesto and I'll be sure to send you some olive oil via La Poste. But didn't you also promise (a while back) an explanation for the reason he's wearing the halter at all? He didn't have it before his pedicure, did he? I think the quote should be "How come he gets the grass/bugs and all we get is fenced in mud! Must be the halter..."
Blue is definitely Dan's color. It brings out his smoky eyes. And it's not a pathetic halter, it's 'organic' and 'natural'. Maybe he should open a halter line. Donkey Doodle Dan's Deconstructed Designs, Inc. I love all your pics!!! I think you should join the blog home tour! Check out www.boomama.blogspot.com for the instructions.. or see my blog! I think the quote should be "Halters are so 80's....get with it, Donkey..."
What a fashion no-no, Danny boy. Jeff has it down. Fortunately, they don't generally try these humilating duds on bipeds. I guess that's the price you pay for access to bugs and grassy bits. Our consolation is how fine our feathers look against the contrasting background. Doesn't alter the fact that it is MUD, though, Susan dear. Now that you mention it, L(tC) and Whitey, your feathers do indeed look remarkably nice. Kudos for taking such fine care of yourselves. 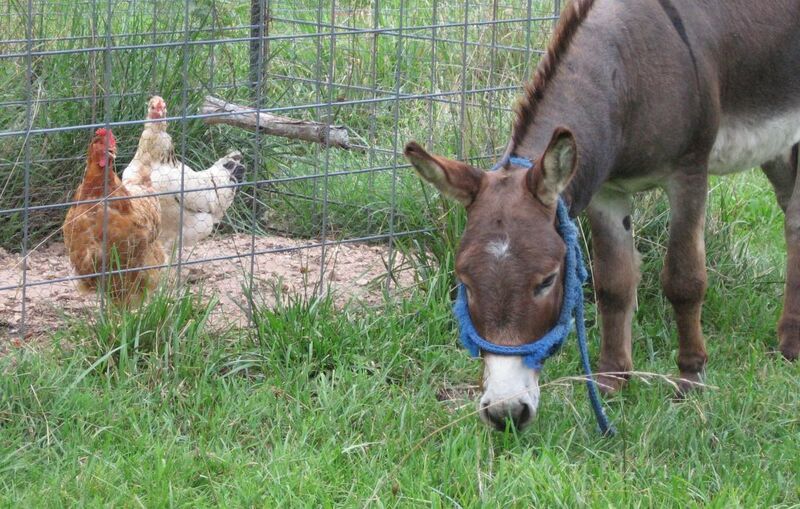 THat donkey could learn a thing or 2 from you. Susan, I think your next priority should be upgraded, luxury accommodations for our feathered friends.